The pundits keep laughing about President-elect Trump’s use of Twitter for diplomatic statements. They shouldn’t be laughing. It’s dangerous. The problem with Twitter: It’s a NON-NARRATIVE medium. I showed this in my 2015 book. 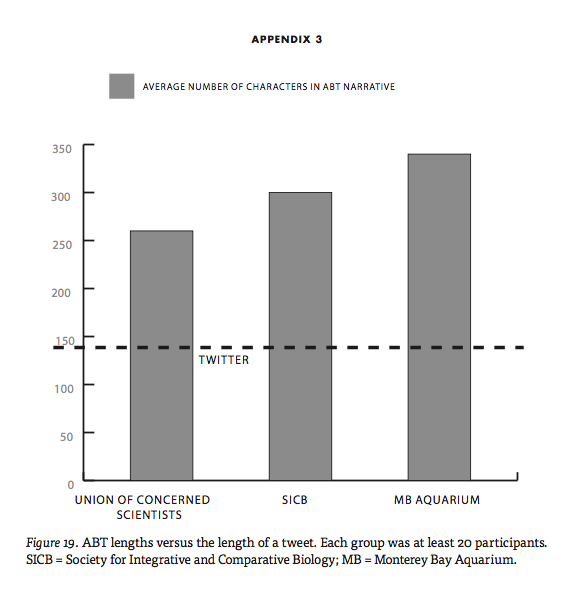 I compared the average number of characters needed for a narrative statement (an And, But, Therefore or ABT statement) versus what Twitter allows. The difference is huge. This means there is little chance to put comments into context. Stephen Colbert found this out the hard way in 2014. For Trump there will come a disaster soon based around his tweeting, and it will be the result of the medium being non-narrative. Maybe that will wipe the smiles off the faces of the pundits. This isn’t going to last long — the tweeting of soon-to-be President Trump. It should have already been shut down by Congress, but they lack the cojones for such a move. How is it the most important diplomatic voice of the U.S.A. is not only being allowed to communicate broadly, wildly and unchecked, but also, more importantly, through a non-narrative medium? Last night on MSNBC Hardball they were swinging in the dark about how Twitter works in relation to diplomacy. “You don’t know what it means,” Michael Steele said, “in an industry that is all about precision.” That precision comes from the ability to begin statements with clear exposition that set up the world, the stakes, and the overall context before diving into the conflict. Twitter does not allow for that. Something bad is coming very soon from Trump’s tweeting. When it happens, the first people that should be held accountable are the journalists and pundits who right now are laughing at how funny it is that we have a tweeting President. This shouldn’t be happening, folks.